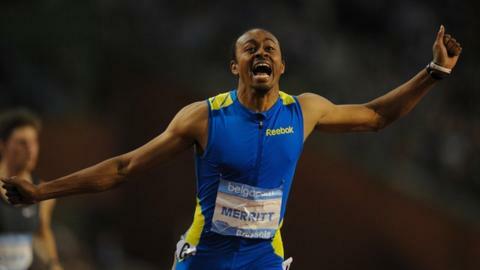 Aries Merritt stole the limelight with a stunning new 110m hurdles world record of 12.80 seconds in the final Diamond League meeting in Brussels. The American Olympic champion took a huge seven hundredths of a second off the previous record of 12.87 set by Cuban Dayron Robles in Ostrava in 2008. Jamaican star Usain Bolt clocked a modest - by his standards - 9.86secs to win the 100m despite a slow start. "I knew from the way he got out of the blocks that he might break it. From hurdle two he was pulling away from a class field and he made it look so effortless. It is rare that anyone wins the Olympics and then goes on to break the world record in the same season. When you know what it takes in that event, it was great to see. It was sensational, just sheer magic and perfection." Compatriot Yohan Blake ran the ninth fastest 200m ever, winning in 19.54. "I came off the turn and I felt it [the world record] was there for me," said Blake, who ran 19.26 seconds - the second fastest 200m ever - at the same stadium last year. "I wanted to push more but when I felt no-one was beside me, it wasn't really there. But I have finished the season getting better and better and I will come back stronger next year." Merritt could say the same after becoming the first man to run eight sub-13 second races in the same season, smashing his own previous personal best of 12.92 in the sprint hurdles. "I can't believe I ran that fast - I'm in shock," the 27-year-old told BBC Sport. "I was focused on running under 13 for one last time to cap off a really good season, and I obliterated it. "When I crossed the line and saw the time I was still in shock. I think it was almost the perfect race. I had a good reaction out of the blocks and I just kept going. "I'm so happy I'm finally living up to my potential after all this time with injuries and hamstring tears and so many people telling me I should throw in the towel and get a normal job." Britain's Lawrence Clarke, who finished last in 13.71secs, was in the next lane to Merritt. "I was just watching him, he was 15m head of me. I completely forgot about my own race." Bolt, who made history by defending his three Olympic titles in the 100m, 200m and 4x100m relay in London, admitted he was "drained" at the end of a stunning season. "I just went through the motions pretty much," he told BBC Sport. "It was an OK race, I didn't lose, that is the most important thing. I am just happy to get through the season injury-free. "I came here for fun, for the fans, because an Olympic Games drains you physically and mentally." Britain's Perri Shakes-Drayton produced another sub-54 second 400m hurdles and her third fastest time of the season - 53.89 - to finish second behind Diamond League winner Kaliese Spencer of Jamaica, who won in 53.69. "I am very pleased, I wanted to end on a high and it is another progression for me," said Shakes-Drayton. "I didn't do as well as I wanted at the Olympics, so I am hungry, even more than before." Chris Tomlinson finished fourth in the long jump with a best effort of 7.96m, while Martyn Rooney came fifth in the men's 400m behind Belgian Kevin Borlee, who pipped his brother Jonathan to win in 44.75. Lawrence Okoye finished fifth in the discus with a best throw of 64.67m, Estonian Gerd Kanter taking victory with 66.84m. The 20-year-old Briton will now contemplate whether to continue in athletics or take up a place reading law at Oxford University. "I have got to sort my life out and chat to the pople at Oxford when I get back," he said. "There is no doubt in my opinion that if I carry on in athletics, I will be the best. Another year under my belt and I can target gold at the World Championships in Moscow next year. I just have to weigh everything up."